When you think of New York City, what visual comes to mind? Towering buildings lined along a coast flanked by long, winding bridges, surely. But zoom in a little closer, will you? Hyper-focus on the city’s people. Of variant origin stories, each person their own hero in the making. Few documentation projects have accurately captured this cinematic appeal of New York, of its stories like Humans of New York. Brandon Stanton’s photography and storytelling movement is evocative of the differences that exist among New York citizens as it is conscious of our similarities. Almost like a portrait out of Mr. Stanton’s project is Ms. Sloufmann’s and Mr. Baez’s fifth grade classroom at P. S. 17, the Henry David Thoreau School in Astoria. As part of my Teaching Artist training with the Community-Word Project, I have the good fortune to assist CWP mentors Alex Velozo and Maria Schirmer in a poetry-photography hybrid class. 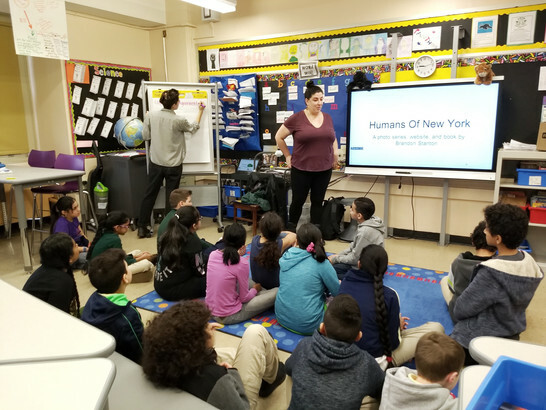 Bringing their respective vocations of photography and poetry writing to the classroom of bright, meticulous, and unfiltered fifth graders, Alex and Maria took the Humans of New York project as a model to channel visual and literary storytelling. Our first class with the bunch was on January 22nd, when Alex, Maria and I introduced ourselves to the classroom. Ms. Sloufmann and Mr. Baez have a democratic class set-up, where students can engage in the meeting area or at their high desks, depending on where they felt like it. Allowing them to choose the meeting area as the setting for the CWP class immediately set the tone for the session. This was going to be a class where their voice and their opinions would take centerstage. We began with an opening ritual, where students could extend their arms and notice the elements above, then dip their shoulders and notice the elements below. This helped them loosen up for the class, and get comfortable for the session that lay ahead. Much before they could dwell on the elements of the CWP class, Alex and Maria felt it important to establish some guidelines for appropriate classroom behaviour. They drew up a chart, creatively titled Community Agreements, and allowed the students to come up with the basic tenets that should outline the classroom. The class sprung up with suggestions of mutual respect, empathy, creativity and originality. Everyone in the classroom, including the CWP instructors, the classroom teachers, and myself, signed our initials on the chart, making us all equal participants in class progress. Alex then introduced the Humans of New York Project to the class by asking who among them considered themselves artists. A question that would bewilder most adults had the students nodding with self-awareness. 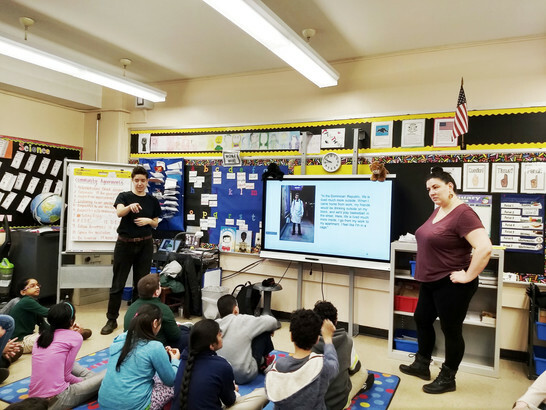 Alex then proceeded to show them two HoNY photographs, with the accompanying text, and allowed the class to mull on the visuals and make observations. A popcorn activity like that with fifth graders can get chaotic pretty soon, but Alex and Maria managed the classroom by giving everyone a chance to contribute. The eye with which the fifth graders analysed HoNY’s portraits and words was revelating. The students were excited that their city has been so actively captured by an ongoing storytelling series. Within the first class itself, one could sense a budding eagerness for the upcoming sessions taking place. Even as I took away some helpful notes about classroom management and lesson planning skills, I’m enthused at the prospect of bearing witness to some innovative storytelling from the class. I’ll keep you updated!